Social enterprise offers the perfect business model for those that aspire to do some good and make that work sustainable. Social Enterprise has seen a huge growth in the past number of years; more and more social enterprises are taking shape and more companies are becoming aware of its valuable role. A growing number of not-for-profit organisations are seeking opportunities to start or expand ventures that fulfil their mission and provide earned revenue. A social enterprise is an organisation that achieves both. Social enterprises face some unique challenges. For example, in a social enterprise you don’t just have to be concerned about keeping the customer satisfied. You have to satisfy your social ambitions too – whether that involves serving a community, protecting the environment or solving a social problem. This toolkit is intended to help you understand the challenges and provide you with the skills to achieve your ambitions. 1.1 Is this Toolkit for me? 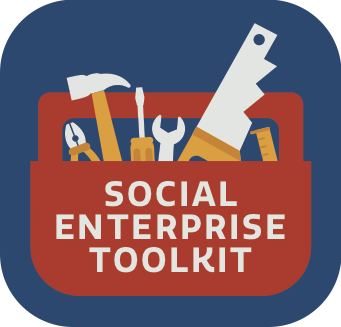 This Social Enterprise Toolkit is for communities and individuals thinking of setting up a social enterprise in Ireland. In short, this guide is aimed at communities and individuals with an idea who want to make the world a better place. Setting up a social enterprise, or transforming an organisation from a charity, public sector or private business into a successful social enterprise can be a daunting, challenging yet exhilarating experience. You can sometimes feel isolated on the journey and that’s why it’s vital to learn from the experiences of those who have gone before you. That’s why we embarked on writing this plan to help you understand how to overcome such challenges. There’s a lot of information available for start-ups, and this guide takes you through the essentials. But we focus on the skills that are most important in a social enterprise. When you are setting up a social enterprise you normally write a business plan, undertake the task of establishing the enterprise and commence operations. Embracing this toolkit will certainly help you get there. With a social enterprise, there are a few additional skills you need to learn when setting up the organisation. 1.2 What is Social Enterprise? Social Enterprises are business models set up to tackle social, economic or environmental issues. While they are driven primarily by social and/or environmental motives, they engage in trading or commercial activities to pursue these objectives and produce social and community gain. 1.2.1 What does that mean? Well, these are organisations that sell products or services for a profit. With this profit, they can have some social impact. By way of example, let’s take an organisation that makes coffee. The organisation sells that coffee for a profit and, with that profit, they can help people who are homeless. So, the more coffees that they sell, the more profit they have, the more money they have available to help tackle the homeless crisis. Social enterprises also, more likely than not, employ people who are socially excluded or marginalised or who perhaps might not have had a job otherwise. 1.2.2 Have you got any examples? Oh yes, we do. Throughout this guide, there are case studies of trading social enterprises that are creating an impact in our society. Examples like Recreate, the Green Kitchen, Rediscovery Centre and more. Private Sector: These are pure businesses that trade to maximise shareholder value. They are profit seeking and focus on making money. You can break up your understanding of charities and businesses and social enterprises too under two headings, priorities and funding. 1.3 What makes it a social enterprise? Social enterprise is not a legal term. It refers to businesses that exist for a social purpose. In Ireland, you can’t register your business legally as a social enterprise. There are various legal forms that are used to incorporate social enterprises. Impact: Having a clear social and/or environmental mission (set out in your governing documents) and reinvesting the majority of your profits to further the social mission. Finance/ Profits: Generating the majority of your income through trade. This is regardless of what form the organisation takes. So, if you have these in place – you are acting as a social enterprise. Selling products: This can be everything from metal work to coffee and from festive cards to bottled water. Selling services: Social enterprises can deliver anything from consulting services, recycling, or property management to training, courier services, lawn maintenance, running cafes or restaurants. Income Generation: A social enterprise can generate profits from any of its services and can sell such services to members of the general public or specific companies or government agencies. Outcomes: The range of outcomes that social enterprises can deliver range from employing people with learning difficulties, providing affordable psychology services to low income families or assist in helping young people find work. The list is endless. There are plenty of examples of social enterprises and the impact that they can have. Social enterprises contribute to vibrant economies. In addition to creating new jobs and enabling non-profits organisations to sustain their services, there are many areas where social enterprises are positively impacting on healthy and sustainable communities. Environment & biodiversity: Upcycling, recycling, food production, composting, eco-tourism, nature wildlife and preservation sanctuaries can all be set up to tackle climate change and social impact. Inclusivity: In many communities, social enterprise can help bridge the gaps between young and old, or settled and Travelling communities, or new immigrants into smaller towns and villages. Overcoming social exclusion: Social enterprises can work with those more vulnerable or overlooked in society by providing apprenticeships, training, skills, resources and related opportunities for a living wage; offer affordable housing and offer the support needed to assist those in difficulty. Community and Business: Social enterprises can often play a vital role in bridging businesses with communities and offering companies the chance to invest or purchase in a more socially responsible manner. 1.5 What is a social entrepreneur? When you hear of social enterprise you may also be thinking of the term social entrepreneur. Social enterprise can be looked upon as a subset of social entrepreneurship. Social entrepreneurship is the art of using all that you have on hand to take advantage of marketplace opportunities to achieve sustainable social change. Social entrepreneurship captures a lot of different company types. It includes socially responsible investors, corporate social responsibility, social innovators and others. These types of entities are not considered social enterprises unless they directly address social needs through their products or services or the numbers of disadvantaged people they employ. The real test for an entrepreneur is what they see for the future of the business. In a private business, the owner can look at a return on their hard work in growing and building the organisation, particularly if the business is sold. A social enterprise takes as much hard work to set up and run but, should it cease to trade, it either has to wind up or merge with a similar not –for- profit company. The directors cannot sell their successful business for personal profit. The asset lock ensures that the assets – money, equipment, building, etc. – are passed over to another social enterprise or charity to continue its social purpose. Therefore, an entrepreneur is creating a business that they don’t own. They can work and earn a living out of it and, if they decide to move on in the future, they will have created a sustainable organisation that has a succession plan. Their satisfaction will be in leaving a legacy business that can continue to deliver for the public good. We will find out more later on the legal terms used in setting up a social enterprise. ReCreate, started in 2013, is an award winning social enterprise making art materials and educational supplies affordable and accessible to every sector of the community for all kinds of creative purposes. This is achieved by salvaging clean, reusable materials from businesses and distributing them to members in unlimited quantities. The project is based around the concept known as Creative Reuse which encourages the public to reuse materials on an industrial scale that would normally be sent to landfill or for recycling, for all manner of creative and inventive purposes. The business model is that members pay a nominal annual subscription fee and in turn have unlimited access to the materials stored in ReCreate’s Warehouse Of Wonders (WOW) and its facilities, which include a workshop and member’s area. ReCreates space, known as the ‘’Warehouse of Wonders’’, has had close to 15,000 visitors in 2017 to date, and showcases what can be done with the materials through display and workshops as well as storing the materials to allow easy access by the public to take away for reuse. ReCreate are creating a welcome space for the whole community, and in 2016 published “Heads Up”, their first publication on the positive benefits of using reuse materials in inclusive classrooms, in conjunction with Trinity College. ReCreate has over 1,200 members, mainly comprised from the early childhood, education, special needs, community and arts sectors as well as families and individuals too. There are also now over 250 suppliers on the Recreate database. These include the likes of: Smurfit Kappa; Avoca; Bewleys; IKEA; Dundrum Town Centre, Universal Records; Ricoh (printing) and TileStyle, to name just a few. Each year we divert over 200 tons of materials from landfill. The Green Kitchen Café & Garden Centre is a Social Enterprise that generates traded income and achieves good by reusing future profits to further their social inclusion work. The activities of the enterprise cater for a social need in the community, promote training and work experience opportunities for people while being self-sustaining. The organisation was set up by WALK, a charity that supports people with intellectual disabilities. WALK aims to create and sustain a social enterprise that fulfils a social need within the community while creating employment opportunities for people disabilities and other persons distanced from the labour market. The first Green Kitchen café opened in 2014 in Walkinstown Green, Dublin 12. The cafe was set up to provide great food and an opportunity to employ people who are socially excluded or marginalised and who might not otherwise source a job or find meaningful employment. The cafe purposely does not display brands or markings on the wall or overtly claim that it is a social enterprise. To most customers, the café is similar to any traditional café and gives no indication that it is trading as a social enterprise. This is a deliberate policy as the Green Kitchen wanted to show that they were focused on the quality of the food and the experience that customers gained from dining there. Also, for the people who gain training and work experience in The Green Kitchen, their CV shows time working in a busy, commercial operation. Adjacent to the café is the Green Garden Centre. The new shop provides access to an oasis of calm and colour with vast range of quality garden products. They provide advice on gardening and have horticultural experts who will give tips to customers. There are many freshly grown items on sale there, too. Most importantly, their garden centre offers excellent opportunities for the people they support to become involved in this fantastic community initiative while learning a new skill. Green Kitchen opened up two further franchises in 2017: Ballymun Rediscovery Centre and the Richmond Barracks in Inchicore. Since it was founded in 2004, The Rediscovery Centre has expanded its operations to become a national leader in resource efficiency and waste prevention. One of the platforms for this expansion has been the Rediscovery Centre’s 4 key social enterprises: Rediscover Furniture, Rediscover Fashion, Rediscover Cycling and Rediscover Paint. Each of these social enterprises take waste materials and reimagine them as high-quality, sustainable products for sale with revenue generated reinvested in the programmes. The Rediscovery Centre’s social enterprises lie at the heart of its mission to support circular economy principles for low carbon living and the support green economy. They participate heavily in community employment and training schemes, whereby the long-term unemployed or educationally disadvantaged are offered work in the centre and trained in new skills. In 2017, the Rediscovery Centre embarked upon a new venture and opened a dedicated centre of excellence in education for sustainable development. Key to the centre is a collaborative Ecostore, supporting enterprise development and providing a ‘bricks and mortar’ space for eco-designers throughout Ireland. The store has also enabled the Rediscovery Centre’s enterprises to add to its product lines, take on more trainees and extend the centre’s influence in the community and with the wider public . As a creative space connecting people, ideas and resources for the circular economy, the Rediscovery Centre has become a hub for social enterprise innovation which supports and fosters collaborative action. You don’t always have to set up a company or a social enterprise. Before you even begin it is important to ask yourself a few questions. There are already a significant number of organisations tackling a number of issues, both across the world and close to home. Many people commence approaching a problem by considering setting up a new business. However, very often there are existing organisations and individuals already fulfilling that role. You don’t have to start something new to get that off the ground. If you do decide to start, you might believe that your idea is tentative and vulnerable. It may be surrounded by uncertainties and a a lot of unknowns. What makes sense to you might not make money or people might not buy what you are producing. You also may believe your idea might be stolen. NDAs put too much focus on the idea. NDAs make you look inexperienced. NDAs stifle idea sharing and creativity. “Entrepreneurial mindset refers to a specific state of mind which orientates human conduct towards entrepreneurial activities and outcomes. Individuals with entrepreneurial mindsets are often drawn to opportunities, innovation and new value creation. Frequently, setting up an enterprise can be a lonely road on which to embark. It’s important that you are as well informed as you can be to set up a company. In the early days, it is all about doing everything down to the last detail. When money is in short supply, you are often called upon to be the chief accountant, cleaner, marketing person, sales rep, print cartridge re-loader and many more jobs that are not in the job description. It is also hard to set up a social enterprise unless you feel that you are financially supported. You might be long term unemployed.